For peach base: Use 9 canned peach halves, drained; 1/2 teaspoon cinnamon; 1/4 teaspoon ground cloves, and 1/4 teaspoon nutmeg. For oatmeal topping: Use 1/2 cup quick-cooking rolled oats, uncooked; 3/4 cup enriched flour, 1/2 teaspoon salt; 1/2 cup brown sugar; 1/3 cup melted butter or margarine, and 1/2 cup chopped nutmeats. 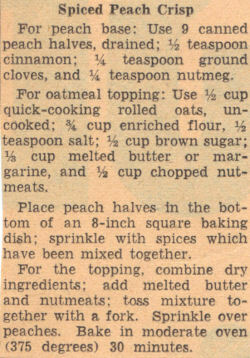 Place peach halves in the bottom of an 8-inch square baking dish; sprinkle with spices which have been mixed together. For the topping, combine dry ingredients; add melted butter and nutmeats; toss mixture together with a fork. Sprinkle over peaches. Bake in moderate oven (375 degrees) 30 minutes.